EntityTransaction Interface used to control transactions on resource-local entity managers. The EntityManager.getTransaction() method returns the EntityTransaction interface. A transaction is a set of operations that either fail or succeed as a unit. Transactions are a fundamental part of persistence. A database transaction consists of a set of SQL DML (Data Manipulation Language) operations that are committed or rolled back as a single unit. An object-level transaction is one in which a set of changes made to a set of objects are committed to the database as a single unit. 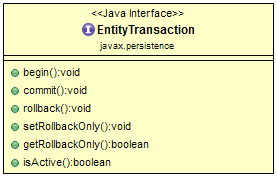 EntityTransaction Interface provides important methods to handle Transactions in JPA based applications. The below are important methods of EntityTransaction Interface. The below class diagram shows a list of methods that EntityTransaction Interface provides. void begin() - Start a resource transaction. void commit() - Commit the current resource transaction, writing any unflushed changes to the database. boolean getRollbackOnly() - Determine whether the current resource transaction has been marked for rollback. boolean isActive() - Indicate whether a resource transaction is in progress. void rollback() - Roll back the current resource transaction. void setRollbackOnly() - Mark the current resource transaction so that the only possible outcome of the transaction is for the transaction to be rolled back. Let's use few important EntityTransaction interface methods to handle transactions in JPA based applications.